Handbags puzzle me. When I was younger I had just one backpack. I used it for school. I sometimes used the same bag when I went to dance classes. When I had classes straight after school and travelled to the dance studio, I just had my bag. Messenger bags slowly became a thing, and at the time I had that ‘rock chick’ style. 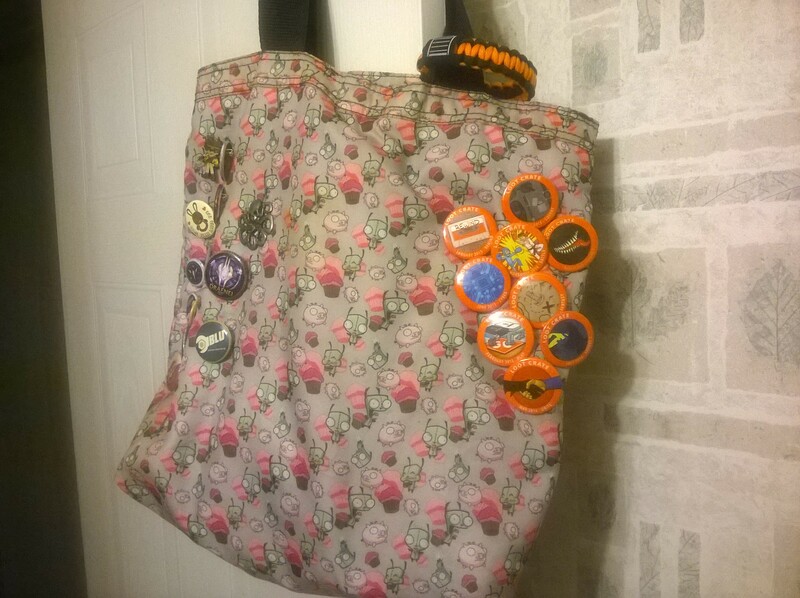 I collected a lot of badges/pins, and people often pinned badges on the straps of their messenger bags. My strap was really flimsy so I pinned them on the front of my bag instead. It got insane. My bag was absolutely covered in badges. After messenger bags, handbags became trendy. Girls in high school would carry a shoulder bag or a tote bag, then carry their books in a folder. I had a favourite shiny silver handbag, but it got thrown around a lot and because I had to put it on the floor (damn it I hate putting my bag on the floor), the bottom of it wore out eventually. Throughout university I carried a messenger bag, but my laptop was insanely heavy that I ended up getting a backpack instead. Of all the bags I used, one thing was common: I loved the bags that I used for a while and used until they fell apart. I know a lot of girls and a lot of women love handbags and may even get addicted to buying them. I was like that at some stage. I’ve never been a ‘girly girl’, but after some time I realised I had handbags lying around that hardly got any use. I had spent money on them because they were nice, and I imagined I would use the bags, when in reality I didn’t use them as much as I had imagined. One thing that stopped me from buying handbags was that I clearly only use one bag at once. I don’t like carrying several bags (who does? ), and like to be able to fit everything I need daily in one bag. So when thinking about a bag I wanted, I thought about this as part of the criteria. Tip: Pick a bag you will want to use regularly. I am not sure why girls feel the need to fit their life in their bag. I don’t wear makeup, but it doesn’t take a rocket scientist to know that you don’t need to carry three lipsticks and your whole makeup bag. Just take what you need to touch up, right? If you are in a rush and you don’t have time to do your makeup so you’re going to do it on the bus (I don’t understand why people do this because it’s not very clean) or at work in the bathroom, then that’s another issue altogether. Some girls carry water bottles and want to carry their laptops and maybe even another pair of shoes. I don’t always carry a water bottle, or my laptop, and I rarely ever carry another pair of shoes. Because I don’t take these often, ‘huge bag’ wasn’t on my list. A medium sized one would be fine. Carrying a laptop separately, in a more protective bag designed for that purpose, would be better than trying to shove it into a perfectly nice handbag. Worst case, a plastic bag for a pair of shoes, or buying a water bottle, would also be alright. Tip: Opt for a well-sized bag that fits all your essentials, and maybe a tiny bit extra, but don’t go overboard. I remember writing in a comment to Pauline, after she bought a designer handbag, that spending a lot of money on a good quality (designer, if you like) handbag was completely OK, if you use the handbag regularly and make it worth its money. Yes, the prices of these things are often inflated because of the brand, but anyone willing to spend a few hundred dollars on a bag should be willing to make it worth its money. For a long time I honestly couldn’t justify spending a few hundred dollars on a handbag. :/ I just thought about all the other things I could buy with a hundred dollars and then didn’t really care. For a while, I went handbag-less, and just stuck to cheap totes, or putting my things in my pockets. If I wasn’t able to fit it in my pockets, then I obviously was going to do without it. Tip: Feel free to spend, but spend for quality and make sure you’re not buying the product just for the brand. We all want a handbag for every purpose, but back to the point I made earlier: a bag is a utility. You want to carry things in it, and carrying something heavy on your shoulder for a long period of time can be inconvenient and can be bad for your arm or back. When I decided to spend a fair bit of money on a good handbag, I eventually settled on one from Fossil. I chose the colour black because most of my wardrobe is black or neutral coloured, and black would go well with it all. You might choose a bright blue handbag because it’s your favourite colour or you just love having a pop of colour in your outfit. You might choose beige because your signature look is beige pants. Tip: Pick a versatile bag in a colour you love. You might be thinking, ‘I can’t live with one handbag’. I know what you’re thinking – maybe you want a handbag for a night out, and you need a clutch. You’re going to the library and you really want some kind of tote bag. Go back and read over the points I’ve made again. You want a clutch to take to the bar? Make sure it fits only the things you need. Don’t spend a lot on a bag that will fall apart after a few uses. Make sure it’s versatile and that you can take it every time you want to go to a bar or a nightclub. Make it the clutch for you. You want a tote bag to carry larger items or to take a festival? Make sure it fits only the things you need. Don’t spend a lot on a bag that will fall apart after a few uses. Make sure it’s versatile and that you can take it every time you want to a festival. Make it the tote bag for you. Just because I’ve encouraged buying less handbags, doesn’t mean you really have to stick with literally one. Grab one of each type, but only if you need them. And I suggest buying a versatile piece that will go with what you like to wear. It’s good to use one bag at a time. That way, you save money from impulse buying and you actually get to enjoy the bag til the very end. I definitely agree with your tips about bags. I think bags should be something that can carry all of your loose items and free up your hands while staying in comfort and being in style. I bought a bunch of cheap bags and always felt some kind of unsatisfaction. I used all 3 of them at the time and switched them around. A few months ago, I ended up spending a few hundred dollars on a Coach bag and fell in love with it. I end up using this one bag and it’s much easier to manage than having to move your stuff over to a different bag every other day ;). I admit that I’m a bag-a-holic, and I’m all about getting good quality bags that will last me for a long time and be functional. I like crossbodies, but I want something that’s the right sized for me to carry what I want to carry. But I discovered that I can’t do a heavy messenger bag all the time, so on the days I carry my Chromebook and several other things, I find that throwing it in a backpack and then carry all my small essentials in my small crossbody works out well, too. Good tips, Georgie. I should really utilise them LOL. But having just one handbag isn’t something I know I’ll stick to easily! I don’t like messenger bags so much anymore because I usually carry my laptop and it is a lot of weight to have on one shoulder. Recently I have been using a separate bag with a smaller handle for my laptop. It isn’t practical, but I do have a backpack (just one haha) that I use for day trips when I need my laptop. I’ve got a small growing bag collection because my mother is the type of woman who spends $$$ on bags and lucky me usually gets a handbag after she gets tired of using them. Normally, they look like new! But I’m the type who won’t buy a handbag for myself, unless if it’s on a good discounted price. I think you make valid points and it’s actually a minimalistic approach to handbag ownership. Also something you already mentioned, I think it’s important to stick to more neutral colors of bags because it decreases temptation to buy a bag just because it can match an outfit. I have a navy blue Kate Spade bag because I just love the color and I have too many clothes in that shade. My mum handed me down a lot of handbags too. While I appreciated them, our styles were very different and I didn’t super love any of the bags, nice as they were. I feel like bags are very personal things. Nice job on selecting the navy blue bag though. If you have a lot of clothes in that colour it certainly works! I used to have a bright red handbag because red is my favourite colour, but over time, even though I loved the bag, I much preferred to have a neutral colour. Tote and sling styles are my favourite! It also took me a lot of bag-owning to realise that I rarely used them. Now that I have found a bag I love, I don’t believe I will need one until this one gets worn out. I believe in buying good quality bags, but I certainly think twice about buying any kind of designer brand because they are very expensive. I only have one bag myself — my mom had a knock-off Coach bag I used for more fancy-needing stuff, but I’ve since retired that a bit too. It’s the same bag I’ve had for about… ten years, I want to say? Now I realize I’m just like you. I can survive on just one bag forever. Kidding. One at a time I mean, until it wears out. I love totes because I can stuff there everything — like all the things you mention you don’t want to bring in your bag. :’D One thing that I always look for when shopping totes is the number of pockets. It should definitely have inside pockets. Nevermind the brand. Hah. I have a bit of a handbag addiction. I’m definitely a one-handbag-at-a-time kind of girl. Occasionally I’ll swap things over to a shoulder/crossover bag, or a clutch, or a bag that matches my outfit better. But generally, I’ll use a handbag until I wear it out lol. I still have a lot of my handbags, definitely need to chuck most, if not all, of them out…. Ones I’ve kept even if they’re torn, just because. Some of them were really nice, I think that’s why I’m clinging onto them :( Dammit haha. My problem with finding new handbags is that the straps are never bloody long enough. The bag has to sit on my shoulder, and it has to be long enough so I can easily access the items inside without the need to take the bag off my shoulder completely. My current handbag is smaller than I’d normally go for but it has an adjustable (one) strap and it’s perfect. I kind of wish it was bigger, though…. :/ I’m so fussy when it comes to handbags!!!!!! I am one to buy a lot of handbags but only use one until it wears out completely. My last bag, which I used for everything from concerts to festivals where I took my camera, to travelling, to picnics… I eventually decided it was time to go when I put it on the floor at a bar and got vodka all over it. It was real leather and normally I would have bothered to clean it, but meh. It was a shoulder bag with a medium-length strap and I loved it to bits. I don’t think you are picky. I also feel the same about bags that have straps that are too short – I want to be able to reach into the bag without removing the strap from my arm, and sometimes adjustable straps get too long or annoying. Haha. I use two at least. I wish I could use just one, but I’m a sucker for purses, so I get sucked into the world of designer brands, though the only brand I really buy is Loungefly and that’s because of their Hello Kitty line. But that’s a good idea to use one, I just wish I could make myself do that. I just can’t somehow, but great tips overall! I don’t like oversized bags so I use a small Hello Kitty purse to house all my extra little things like my wallet and etc; Still, it would be easier to use one bag for everything, I just love using Hello Kitty items aka bags, totes, purses, or anything Hello Kitty. That’s my only downside. How funny, I wrote about my bag today ;) There’s no need to convince me to buy fewer handbags because I’ve never bought one in my life. I usually use a backpack for everyday life. I also own a few messenger bags, which I’ve used regularly until about 8 years ago – when I started getting terrible backpain from them. One of them used to be a boat, the other is a black army-style bag (which also had a few buttons on it). I also own one actual handbag, which my brother once gave me as a birthday present. I actually only use it when I need to dress up, such as for weddings, job interviews or similar events – that happens maybe once or twice a year. I was going through your minimalist posts, and I came across this one. It is what happens with me…I love buying new bags, but when I do to purchase one, I always wonder where will I use it! These days, I need one backpack for my college which is a laptop bag so that I can carry my laptop when I need it. I also have a messenger bag and a tote which I used alternatively to college if I don’t need to carry my lunch box or I am going for a movie or an outing with friends. I don’t even have my own handbag right now. Because there are 3 women in my house, we share the not-so-needed bags. My sister and I usually buy bags we both like so that we can share it and reduce the unnecessary expenses on things that will be ruined if not used properly!